Have you ever been inspired? Have you been motivated to go further than you ever have beforeto reach for the stars? Who was that person who inspired you? Why were they able to influence you? How did they do it? What was it about themdo you know?Is there a secret to inspiring others to catch your vision and make it a reality for themselves?Do you realize you, too, can motivate and inspire others to… reach beyond their internal boundaries which have blocked them from success? The answer to all these questions can be discovered through biblical principlesThree universal secrets to successful leadership. It all begins by allowing your spirit of Barnabas to emerge. 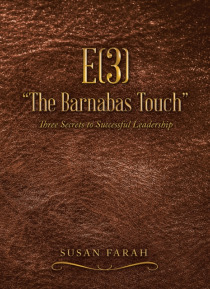 The Barnabas Touch has been specifically fashioned to challenge you, to encourage you, and to unleash the power of the passionate and purposeful leader inside of youthe one you have been destined to be.So, Open your mind, open your heart and open this book your successful future awaits you.